Following the release of his debut EP to broad critical and fan acclaim in 2013, London-based singer and songwriter Myles Sanko, the “love child of soul music”, now launches his first full-length album, “Forever Dreaming”, a stunning collection of tunes with a musical quality that is rare today, out on P-Vine in Japan and on Légère Recordings in Europe on Sep 12th. Consisting of eleven deep meaningful soul grooves, jazzy musical perfection and a play time of approximately 40:19 minutes, “Forever Dreaming” has a vintage feel that could easily have been recorded 40 years ago, were it not for its fresh contemporary twist. Ranging from the melodic Motown sounding title track through to the spiritual acid jazz of “Save My Soul” and the uptempo dancer “Shooting Star”, this is a superb album packed with beautifully recorded Fender Rhodes, flute, vibraphone, percussion and all the instrumentation you’d expect from a good soul record. 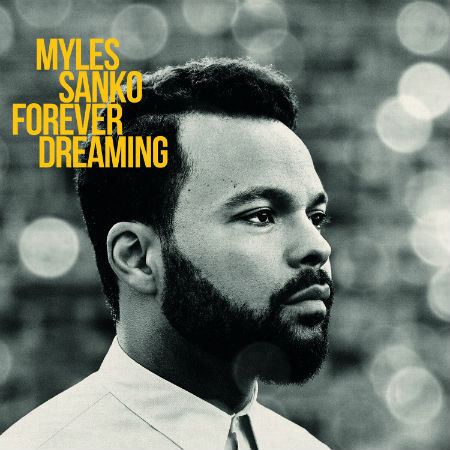 Myles Sanko‘s musical output in the last year alone has made him a genuine shining light in an ever-competitive and burgeoning soul music scene. With eight piece band Rick Hudson (drums), Neil Cowlan (guitar), Tiago Coimbra (bass), Tom O’Grady (piano/Rhodes), Neil Penny (trumpet), Matt Mckay (saxophone/flute), Tom White (trombone) and Ric Elsworth (percussion) that he can rely on, Myles Sanko has put together 10 versatile compositions alongside longtime songwriting partner Thierry Los from France. From the moment you press play there’s no doubt this album marks the rise of a new soul star, and that’s no dream, that’s a matter of fact.